Hello Al, you keep crossing my mind, and I enjoyed your Detour very much. 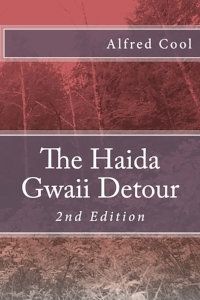 I hope you got your books into all the Visitor Centres and book stores in Haida Gwaii, I know it would be a best seller! I hope your books get the attention they deserve! — Alexis G.
I really enjoyed it. I did know a bit about Port Radium, but it's always good to learn a bit more about such horrible things. And I have a fascination with the North, so I love to read about it. — Allister T.
“The Hottest Place on Earth” is a Canadian story that needs wide sharing, a missing tile in our history told with the interlocking, international players. It ends at Wall Street where many of our government policies originate. This book will have foreign sales as our radon gases reach world wide. It has a film potential. — Bernice L.
I love your writing; laughed so hard at some of the stories, especially the enterprising young man from Richmond doing scams and tricks, but really all of it! I am already to where u are cooking at the camp. Love the humor and historical parts. It’s hard to stop reading… — Li S.
I have read 85% and I love it! From my lay persons perspective this is a wonderful, funny, gritty, gutsy book. Your ending was far better than anything I could imagine ... Big congrats, powerful stuff to enjoy and think on. — Michael C.
My honest liking of your story, style and TRUTH. You write with an open heart, mad head, and compass still heading True North in your intent. I was entertained, shocked, chilled to the bone ... I was reminded of one of my all-time faves, then, now, forever...Mr. Kurt Vonnegut...the truth served in insane "amuse-bouches" of misadventures. — Lorraine H.
Canadian Travel and adventure, and a new page in Ethan's story await him when he dares to change his life and move to Haida Gwaii. More books by the author ... Amazon Prime!